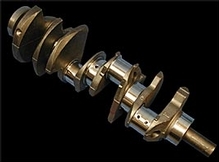 Our crankshaft cores are hand picked and inspected for stresses and imperfections. Any signs of stress or heat and the crankshafts are deemed unusable. The crankshafts are then thermal cleaned in our slow up and slow cool down bake oven system. This ensures proper cleaning of impurities and provides a seasoning condition. We then magnaflux the crankshaft to check for cracks and we inspect the crankshafts even closer for any undesirable imperfections. We then check the crankshaft rod journals for any signs of twist. We then shot peen the crankshaft to clean the external impurities and to stress relieve the shafts. The cranks are all completely checked for straightness and integrity. We check the alignment and straightness on all the main journals, the crank snout, the seal surface for concentricity, and the flywheel flange is confirmed for accuracy and conformity. All journal radiuses are checked for size to insure maximum crankshaft strength. We do all of this with new crankshaft as well. We check and clean all of the oil passages, drill out any imperfections, and chamfer all of the oil holes to insure true an equal flow to all of the engine bearings. If applicable, we will index grind the crankshaft to equalize the stroke of all of the rod journals and place the journals to exacting tolerances in crankshaft degrees specific to the designed crankshaft profile. The crankshaft journal radiuses are all cleaned and corrected for maximum crankshaft stability and strength. Then the crankshaft will go through a hot bath wash to remove all machining debris. If applicable, the crank will head over to the balancing operation. The finished machined crank will undergo a complete quality control check to insure correct target journal sizes, stroke, alignment, and journal finish. Then the crank will be micro-polished with our proven micro-polish system to achieve the ultra smooth finish that is critical. Assembly washing is the final operation and a final check of all crank oil galley flow. Then the crankshaft is ready for assembly.